Handcrafted. 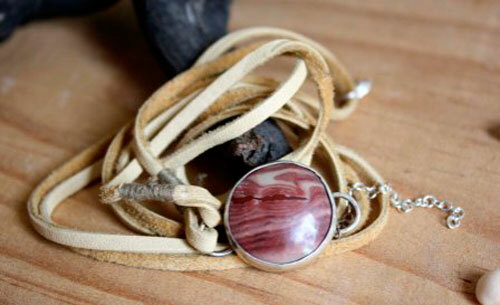 It is made of 925 fine silver, made by hand in my workshop, and a picture jasper. Colored lines ranging from sand to ocher-maroon traverse this round picture jasper. It reminds me of the great red sand deserts that can be found in the United States. One can quote the Arches National Park located in Utah, the Painted Desert, which occupies part of the Petrified Forest National Park in Arizona, or the Bryce Canyon National Park located in southern Utah. 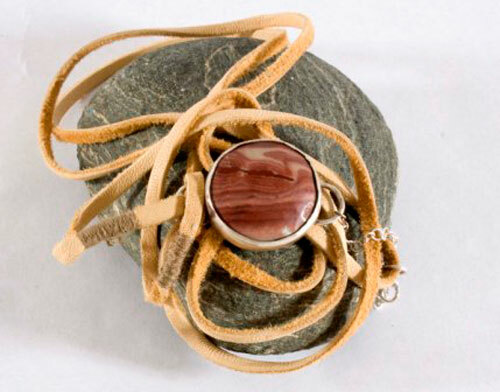 Like in those deserts of red sand, this picture jasper shows a stratification of different color layers that intermingle and dance in a magic and fascinating way. One can only understand the Indian fascination for these places and why they made it sacred territories. 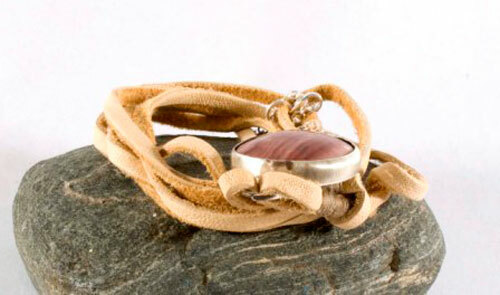 The bracelet is made of deerhide. 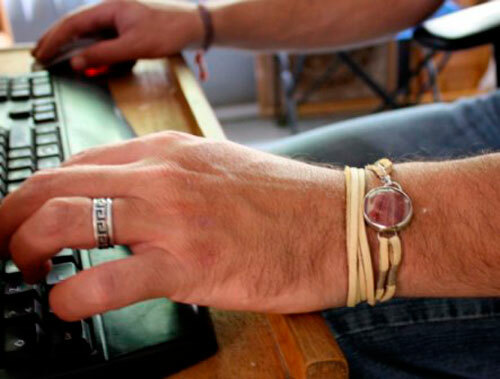 It is a very soft and flexible leather and is really nice when worn. The width is 3 mm and is about 1 mm thick. 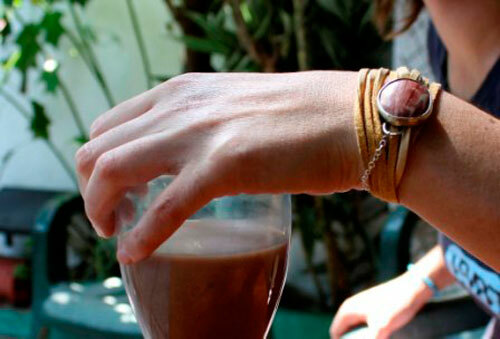 The thinness of the bracelet makes it easier to wrap around your wrist. 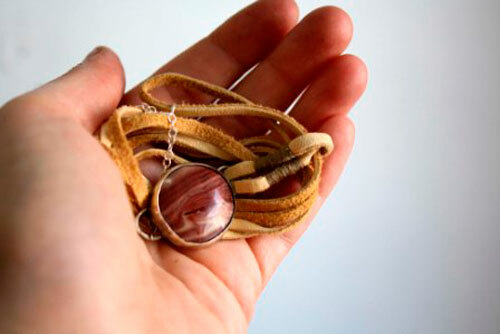 There is also an extra sterling silver chain measuring 6 cm to help you fasten it in the right place. 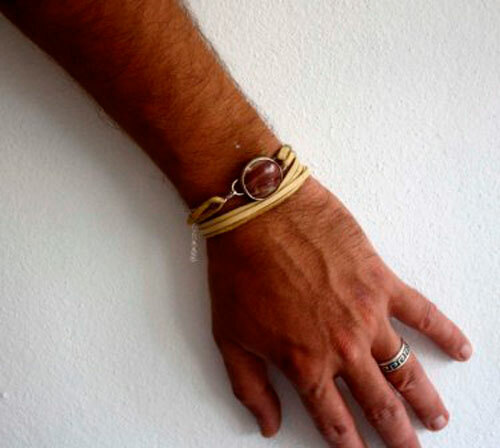 I made it quite long so that it can fit several types of wrists, for men and women. I then oxidized the sterling silver to give a vintage touch. I then brushed the metal. 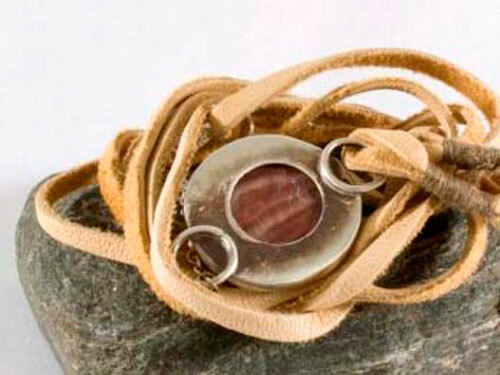 Tag: bracelet, sterling silver, man, leather, stone, cabochon, mineral, oxidized, embossed, handmade, jewelry, unique, picture, deer, jasper, semi-precious stone, round, desert, sand, red, cream, ocher, magical, fascinating, park, reserve, natural, strata, stratification, layer, indian, sacred, USA.